The broad field of urban politics has made substantial progress in understanding the heterogeneous actors, practices, conditions and events that produce, co-constitute and work through the ‘urban’. This literature does however resort to a broad comprehension of ‘actors’, treating these as relatively homogeneous entities in the case of actual organisations (e.g. voluntary sector bodies), or not recognising that individual human actors (e.g. politicians) are often embedded within organisational settings. What is lacking therefore is a more fully developed theorisation of the ‘organisation’ in urban studies. 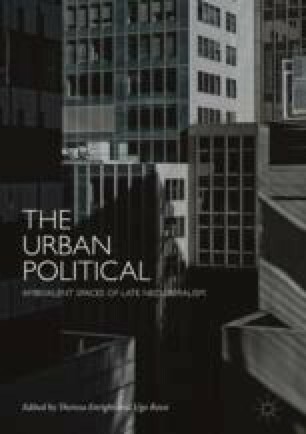 This chapter presents such as framework, the intention of which is to facilitate a more sensitive approach to the complexities and unevenness of urban actors, including a greater understanding of whether post-politics has truly developed in urban politics.